There is growing interest in understanding the factors that influence the academic achievement of students with emotional disturbance (ED). 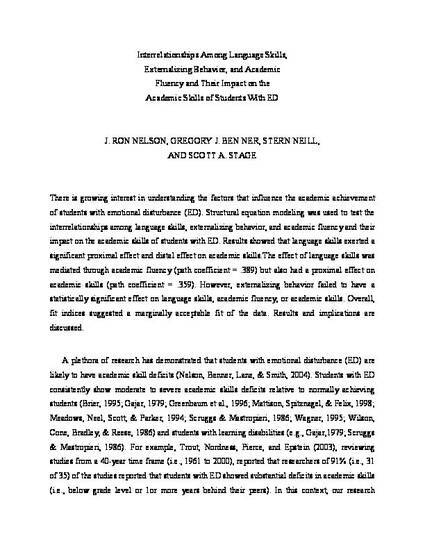 Structural equation modeling was used to test the interrelationships among language skills, externalizing behavior, and academic fluency and their impact on the academic skills of students with ED. Results showed that language skills exerted a significant proximal effect and distal effect on academic skills.The effect of language skills was mediated through academic fluency (path coefficient = .389) but also had a proximal effect on academic skills (path coefficient = .359). However, externalizing behavior failed to have a statistically significant effect on language skills, academic fluency, or academic skills. Overall, fit indices suggested a marginally acceptable fit of the data. Results and implications are discussed.